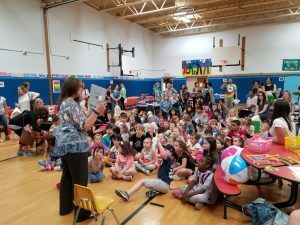 William O. Schaefer Elementary School and Cottage Lane Elementary School joined forces on June 11 for the SOCES K-5 Summer Literacy Extravaganza! Families flocked to WOS for an action-packed session of reading and writing fun, from multi-sensory word play games to literacy-related crafts to a special reading by local children’s author Eileen Malora. Students received writing journals and designed bookmarks and canvas bags to tote summer reading supplies. At the Polaroid selfie station, they dressed up with props and took a photo with their summer reading goals. Representatives from the Orangetown Historical Society, Books & Greetings, the DeWint House and local libraries’ Libraries Rock! Children’s Summer Reading Program shared exciting opportunities to boost literacy and SOCES PTA scooped up ice cream for all! Missed the SOCES K-5 Summer Literacy Extravaganza? Reach out to Coach Joe for information and resources you can use at home to promote literacy this summer and be sure to check out the blogs by WOS Library Media Specialist Patty Eyer and CLE Library Media Teacher Kristine Wagner.